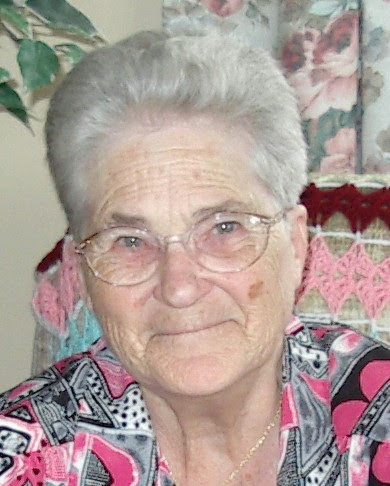 It is with deep sadness that the family of Alexina Marie (Tremblay) Doucet announces her peaceful passing at Rocmaura Nursing Home on October 29, 2018. Alexina was born in Bathurst, NB on October 31, 1924 to the late Jean-Baptiste and Marianne (Cormier) Tremblay and was the loving spouse of 55 years to her late husband, Lenuel Doucet. Alexina was a home maker. Growing up in a big family – she being one of 14 children – she wanted a big family as well. She was a mother first and foremost and stayed at home to raise her children. She had a great sense of humor and was still making jokes two days before she passed away. She liked the outdoors and loved to fish – she could fish from morning to night and never get tired of it. She loved listening to old country music and playing washer toss, camping, knitting, spending time in the great outdoors and making meat pies at Christmastime for all of her loved ones. She was a good mother, she was an amazing grandmother and fantastic great grandmother. She was a gentle, kind hearted and strong willed woman. She will be deeply missed by all who knew and loved her. Alexina is survived by her 8 children; Donald (Doreen) Hachey, Leonard (Judy) Hachey, Aldei Doucet, Claude (Rose) Doucet, Marjorie (Laurie) Hartlen, Claudette (Harry) Rowe, Denise (Kevin) Rowe, Janet Doucet (Gerry) and daughter-in-law Janie, 23 precious grandchildren and many great grandchildren. Alexina was the last surviving member of her immediate family and in addition to the loss of her parents and siblings, she was predeceased by her spouse Lenuel and their children Maurice and Claudette Doucet. Arrangements are entrusted to Fundy Funeral Home, 230 Westmorland Road (646-2424) where visitation will be held on Sunday from 2-4 & 6-8pm. A Funeral Liturgy will be held from the Fundy Funeral Home Chapel on Monday, November 5 at 12noon with interment to follow in St. Joseph’s Cemetery. For those who wish, remembrances may be made to the Alzheimer Society of Canada or to the charity of the donor’s choice. Alzheimer Soc. of Canada Research Dept.